Perhaps the most frustrating aspect of learning guitar is that it initially seems impossible to play anything that sounds good. While it is true that it takes some time to learn the techniques needed to play songs well, the real reason most new guitarists sound bad is because their guitar isn't in tune. Here is a guitar tuning tutorial that, with a little practice, should allow you to keep your instrument in tune. 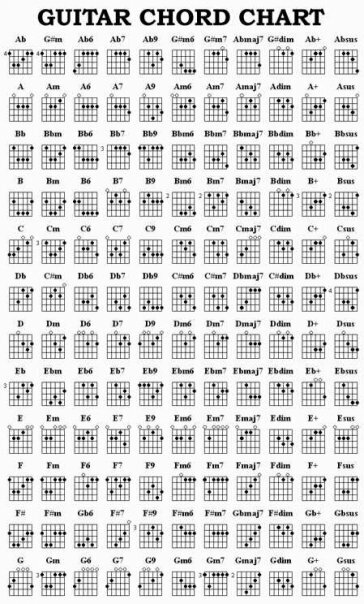 The most common method for tuning both Electric and Acoustic guitars – and the one you can use when no other instrument or guitar tuner is at hand. Tune the bottom E, as accurately as you can. Chances are it’s in tune anyways, being the thickest string it’s the least likely to detune itself than any of the others. If you have another instrument such as a Piano (which stays in tune for years), you can tune it to the 1st E below middle C. If you have no device or instrument handy just try to get it as accurate as possible, what really counts when you are playing is that the guitar is in tune with itself and any other instruments you might be playing with. Place the first finger of your left hand just behind the fifth fret on the bottom E string. That’s an A note. Keep your finger on that fret. Now pick the fifth and six strings in turn, gently adjusting the fifth string tuning peg until the two notes are the same. Place the first finger of your left hand just behind the fifth fret on the A string. That’s a D note. Tune the 4th string (the D note) to that. Place the first finger of your left hand just behind the fifth fret on the D string. That’s a G note. Tune your G string to that note. Place the first finger of your left hand just behind the forth fret (note the B string is the only one that comes from a different position the forth fret, the rest are from the 5th fret). Place the first finger of your left hand just behind the fifth fret on the B string. That’s a E note.